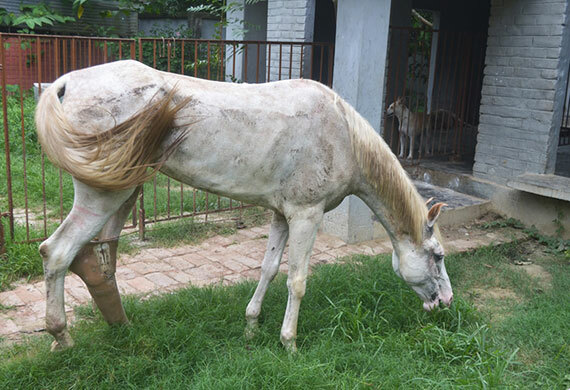 The horse found in Kakdwip on Monday with one of its leg hacked has reached a hospital and home. The seven-year-old brown horse with a white patch running down the middle of his face has got a temporary prosthetic leg and a name, Hira, at Chhaya in Sonarpur. The horse has been named Hira to go with Moti, the wounded horse found on the Maidan on Holi and recovering at Chhaya, Sharda Radhakrishnan, who runs the hospital, said. Metro has been reporting the plight of both horses and about the people who have come forward to help. Hira got proper medical treatment for the first time on Wednesday since he was found on the road near Baladevpur, some 3km from Kakdwip town, on Monday. The prosthetic leg he got at Chhay belonged to a mare called Muskan who is now dead. The stump of Hira’s front left leg is swollen, indicating infection, according to vets at Chhaya. His appetite is good, Radhakrishnan said. He had watermelons, water mixed with jaggery and rice bran on Thursday. So, he wasn’t given any saline drip, she said. Hira was brought to the hospital in a Tata Ace by volunteers of two groups – For the Animals and United for Voiceless. The vehicle was provide by another NGO, Dhyan Foundation. When he arrived, Hira kept stumbling. “The horse was finding it difficult to stand on three legs and the stump kept hitting the ground… so, we gave him the prosthetic leg. We have put in plenty of cushions to ensure he is comfortable.” Radhakrishnan said. The prosthetic leg belonged to Muskan who used to draw a carriage in Maidan area. Her owner had brought her to Chhaya with the left hind leg almost severed. He never came back, Radhakrishnan said. The leg had to be amputated and an NGO, Mahavir Seva Sadan, had provided Muskan with a prosthetic leg. The authorities at Chhaya plan to approach the same Ngo for a prosthetic leg for Hira. “Muskan was a spirited horse. She used to run around the hospital premises with the prosthetic leg. We hope Hira, too, will do so soon,” Radhakrishnan said.